In continuation of the briefing held for the first batch of General, Police and Expenditure Observers held on 14th March, the Commission today conducted day long sessions for over a thousand more officers drawn from IAS, IPS, Indian Revenue Service and few other Central Services. These officers are being deployed as Observers in the forthcoming Elections to the Lok Sabha and Legislative Assemblies of four States. 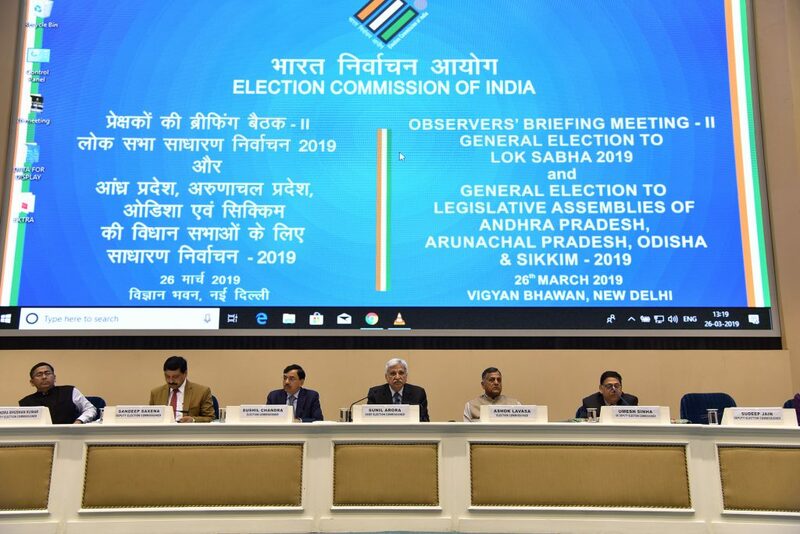 Addressing the participants, Chief Election Commissioner Shri Arora said that while all Observers are essentially the eyes and ears of the Commission, Senior Expenditure Observers are assuming an enormous role given the quantum of money power vitiating the election process. He added that the Commission has already appointed two Special Expenditure Observers for the States of Tamil Nadu, Gujarat, Maharashtra and Karnataka. To further identify the role of illegitimate resources in the elections, the Commission is considering appointing few more Special Expenditure Observers in more Expenditure Sensitive States. Shri Arora reminded the Observers of their enormous responsibility to ensure fair, ethical and transparent election process in the field. He asked them to be vigilant, impartial and accessible to all stakeholders to reinforce the faith in the minds of the citizen towards the electoral process. While elucidating the myriad responsibilities of Observers, the CEC mentioned that Electoral Rolls are the bed rock of election process and Observers need to ensure the integrity of the Electoral Rolls. 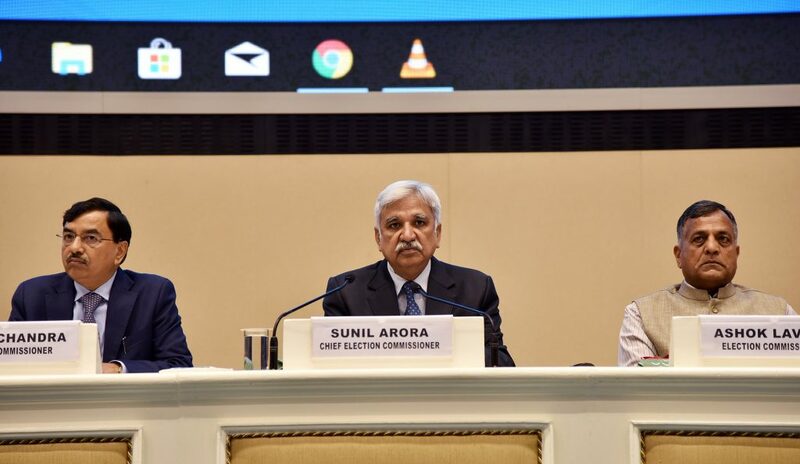 Reminding the Observers of their crucial role , Shri Arora said that The Commission reposes complete trust in the senior officers being deputed to the field and would like the Observers & CEOs to be the first and last point of contact. However, he also cautioned them that even a trace of proven malafide or partisanship, would lead to ruthless action from the Commission. He further added that, keeping pace with the changing times, the Commission has been proactive in making the electoral process participative by involving & empowering citizens particularly through cVigil App. He said that the cVigil App initiative which started as a pilot project in the Karnataka State elections and then implemented in the five State elections held last year, has now been extended pan India for the ongoing General Elections. Shri Ashok Lavasa, Election Commissioner in his address stated that the Observers have been a critical part of the election process and machinery. He advised Observers to be alert, accessible and responsive and effective in the field to ensure fairness and transparency of the election process. He urged the Observers to be familiar with all the instructions & guidelines to ensure clarity in execution in the field. He said the senior Observers need to play dual roles of monitoring and mentoring. While addressing the Expenditure Observers, Shri Lavasa stressed that only the seizure figures may not be taken as a measure of the efficacy of enforcement machinery, but the money trail and actual perpetrators behind the consignment should be investigated. Welcoming the participants, Election Commissioner Shri Sushil Chandra noted that Observers play an important role for the Election Commission for robust monitoring of the complete process in the field. 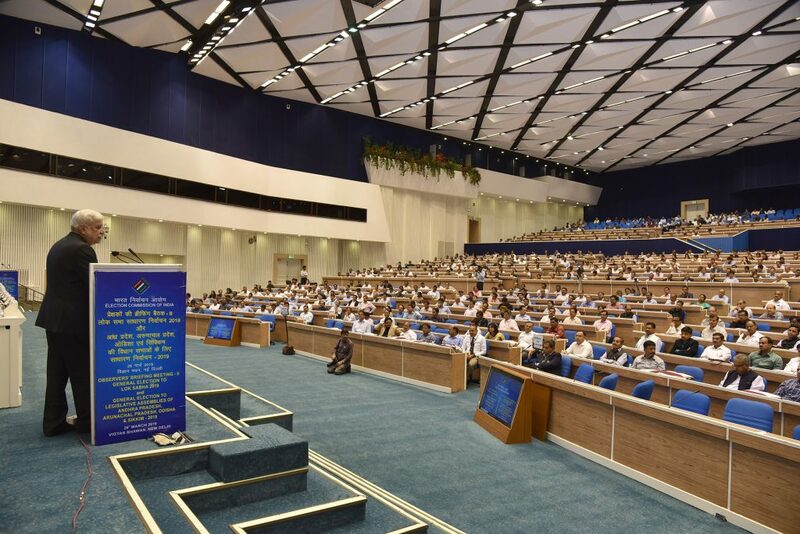 He asked the Observers to ensure better co-ordination amongst all the Stakeholders in the field. Elaborating the diverse challenges for the Observers in the current scenario, he urged them to be vigilant and accessible. He mentioned that developing real time intelligence and monitoring of accounts of the candidates would be crucial to downplay the role of illegitimate resources adversely influencing the election process. Comprehensive Expenditure Monitoring Handbook, Observers Manual and National Election Planner were provided to the Observers to facilitate their work.